Show off your love for your charming puppy on a cozy, comfortable hoodie. Personalized with your pooch in mind, you can wear this as you walk your dog or when you're taking trips to the dog park. Any dog lover will appreciate our sweatshirt. 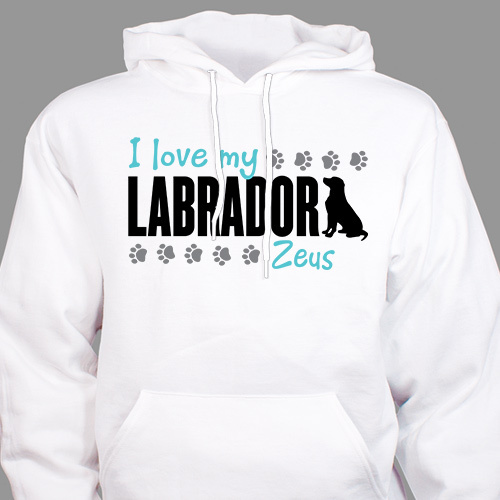 This dog lover design is printed on our 100% cotton, machine washable hooded sweatshirts, available in adult sizes S-2XL. Free personalization of any name and dog breed is included. Additional Details We recommend giving this hoodie to any dog lover and pet owner on your shopping list. Great for birthday or holiday gifts, it's easy for a dog owner to show off their favorite family member when they wear our sweatshirt around town.